The Hydro Pullse™ Sinus Pulse Irrigator was originally developed for chronic sinusitis. But today, more persons use it for throat and snoring therapy! In a recent survey it was discovered that more persons are using the Hydro Pulse™ Nasal/Sinus Pulse irrigator for Throat and Snoring than for Sinus conditions. The Hydro Pulse™ was originally invented by Dr Murray Grossan as a means of clearing sinus and nasal conditions without drugs. There are 33 million chronic sinusitis patients currently in the US according to the CDC – Centers for Disease Control and Prevention. The Hydro Pulse provides a sinus pulse irrigation that not only removes mucus, pollen, and dust from the nose and sinuses, but also pulses at a rate to restore good nasal/sinus cilia movement. In health, normal cilia move bacteria and dust out of the nose and sinuses. Once the cilia return to normal, no further therapy is needed. Most young adults today still have their tonsils and may get tonsillitis. They also may get tonsoliths. Tonsoliths are the hard debris that fills holes in the tonsil called crypts. Because they contain bacteria, there may be a troublesome breath odor. The Hydro Pulse™ provides two throat irrigator attachments because patients with sinus problems may also have a throat condition. The throat irrigator enables easy irrigation for tonsil problems. Doctors recommend the Hydro Pulse throat irrigation as a means of directing a pulsing stream to this area in order to remove those cryptic contents. When tonsils are infected, pulse irrigation of the tonsils to remove bacteria and bring fresh circulation helps natural body healing. If irrigation is started early for any sore throat, then a full blown tonsil infection may be avoided. Increasingly today, patients prefer to avoid antibiotics, hence using irrigation to improve natural healing is preferred. 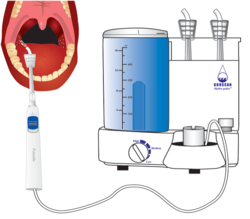 Dr. Grossan designed the Hydro Pulse throat irrigator specifically for the tonsoliths to avoid the need for tonsil removal. Regarding snoring, doctors today stress the importance of good sleep and the prevention of sleep apnea. Often the cause of snoring is flaccid or weak throat muscles. In particular, if the soft palate muscles are weak, then the soft palate may fall back and block proper nasal breathing in sleep.For snoring, the throat irrigation is a means of massaging the throat muscles and tissues. This can reduce unwanted swelling, strengthen the muscles and reduce the snoring. Patients and their partners really appreciate that improvement. It is surprising that Dr Murray Grossan originally designed the Hydro Pulse for clearing sinus conditions. Yet today more people are obtaining and using this product for the throat and for snoring.